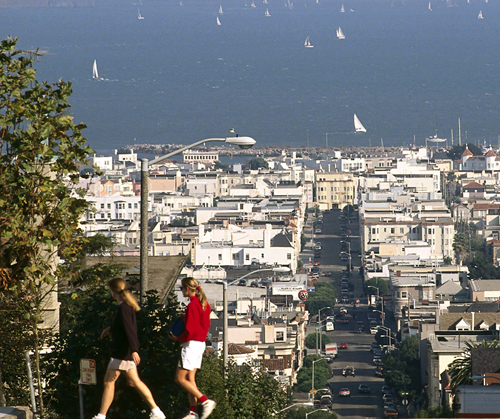 As its name suggests, the Bayshore area spreads out along the Bay at	the northern edge of the city, faces the islands, and enjoys unforgettable views of both the Bay and Golden Gate Bridges. 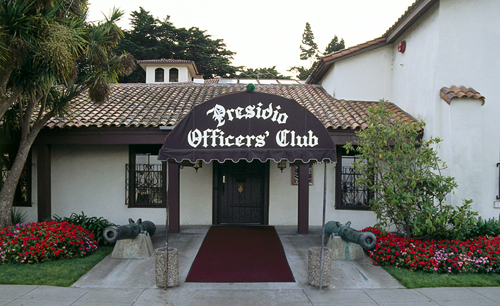 Historically, the city began its life here, when the Spanish set up a military outpost at the Presidio in 1776. 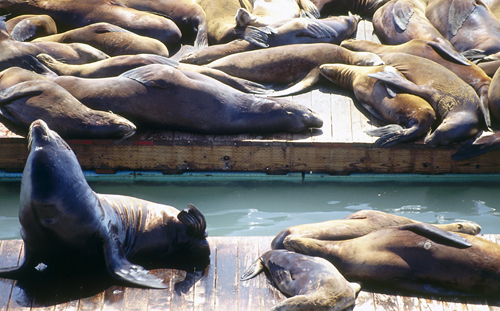 More history can be found at the piers of the northern Embarcadero, including now heavily commercialized Pier 39 and Fisherman’s Wharf, where San Francisco’s fishing industry began in the 19th century. But also part of the area is the smart Marina District, with its swanky homes and two yacht clubs. Some of the finest parks are found here too, most notably the Presidio, Crissy Field, the Marina Green, and the Great Meadow above the Fort Mason Center. A particularly stylish remnant of the 1915 Panama-Pacific Exposition is also found here – the Neo-Classical Palace of Fine Arts – with its hands-on science museum annex, the Exploratorium. Most of the Marina area, as well as most of the Financial District, was built on landfill. As time has proven, this was not such a good idea in a seismically active zone. When the Loma Prieta earthquake struck at 5:04pm on October 17, 1989, all such landfill liquefied, gas mains fractured, and several Marina homes slid off their foundations. Buildings that withstand best are those built on bedrock, which includes most of the inland areas of the city. This world-famous engineering masterpiece sets off the entrance to San Francisco Bay in the most spectacular way, and never fails to elicit gasps of awe from first-time visitors and old-timers alike . Although now largely tourist-oriented, there are still authentic sights to see, aromas to savor, and salt air to breathe among these piers . America’s “Devil’s Island” didn’t operate as a prison for very long, but it can still evoke a chill . A trip out to Angel Island, now a state park, can make for a very pleasant day of picnicking, biking, hiking, kayaking, and swimming. But in the early 1900s it was the “Ellis Island of the West,” where would-be immigrants, mostly Chinese, could be detained for months. During World War II, it served as a prisoner of war camp and later as a missile base. Treasure Island was built in 1939 for the Golden Gate International Exposition and was a US Navy base during World War II; it is now once again owned by the city and has recently become San Francisco’s newest suburb. 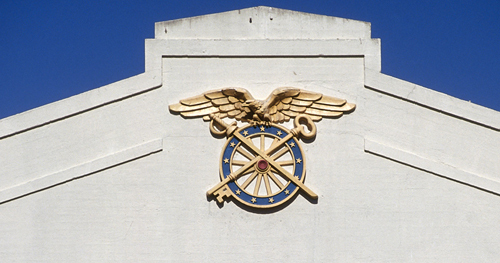 Yerba Buena Island is a Coast Guard station and is mostly closed to visitors. The Embarcadero starts at Aquatic Park and curves all the way around to Hunters Point at the southeastern edge of the city. Now that the Port of Oakland handles the Bay’s shipping needs, the old piers are used for any number of purposes these days, and the parallel road has recently become a park promenade . 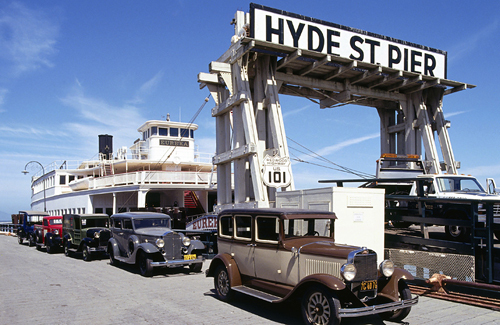 Pier 39 is the most famous since it was turned into an amusement attraction in the 1980s, while other piers house concerts, festivals, antiques fairs, and restaurants. When looking for a particular pier, note that those to the north of the Ferry Building have odd numbers and those to the south, even. Formerly a military base established during the Civil War, some of the army buildings have been devoted to cultural programs of all kinds since 1976. Some 50 organizations now call it home, including museums, art galleries, theaters, shops, festivals, fairs, and performance spaces, as well as libraries and various institutes. 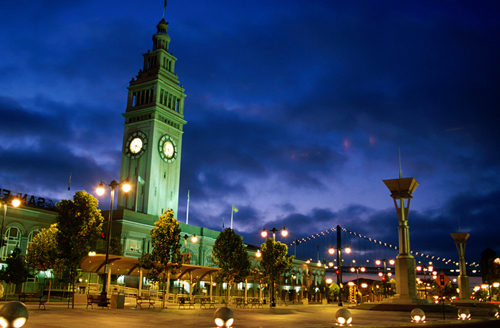 Some of the most prominent are the Museum of Craft and Folk Art and the Museo ItaloAmericano, the San Francisco African-American Historical and Cultural Society, the Children’s Art Theater, the Magic Theater, and Herbst Pavilion. The city’s finest vegetarian restaurant, Greens, is also located here, enjoying unique views of the Bay and Golden Gate. This is a pleasant, upmarket zone, featuring bars and trendy boutiques along Chestnut Street. Marina Green is a vast lawn where locals love to jog, skate, fly kites, picnic, or walk their dogs. At the tip of the breakwater that protects the Marina, you can tune in to the bizarre sounds of the Wave Organ, an instrumental structure of underwater pipes through which the tides slosh in a vaguely musical fashion. The sole survivor – with a lot of help from restorers – of the many fantasy monuments built for the 1915 Panama-Pacific Exposition, the Neo-Classical Palace was an Expo’ centerpiece. The dome of the rotunda is supported by a Classical frieze and an octagonal arcade, which is set off by a landscaped lagoon and flanked by an open peristyle of Corinthian columns . Behind it is the Exploratorium, one of the world’s first hands-on science museums. It boasts more than 650 exhibits, divided into 13 subject areas, such as Electricity, Motion, Weather, Vision, Color and Light, and Sound . Originally marshland and dunes, the field was filled in for the 1915 Pan-Pacific Exposition and paved over entirely for use as an airfield by the army from 1919–36. With the establishment of the Presidio as a national park under the supervision of the city, a massive restoration project has now returned part of Crissy Field to wetlands and the rest to lawns, pathways, and picnic areas. 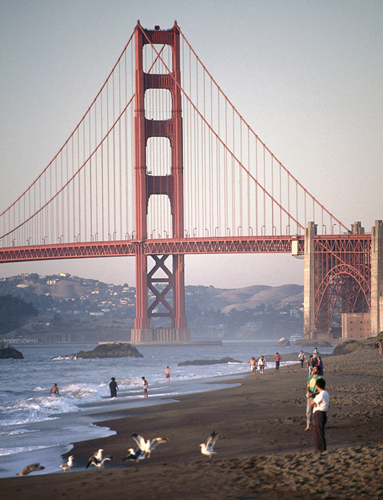 The city’s 100-acre “Front Yard” is one of the prime viewing sites for the July 4 fireworks displays, while the Golden Gate Promenade is a 3-mile (5-km) paved pathway that runs through this district from Aquatic Park to Fort Point. This beautiful wooded corner of the city has stunning views over the Golden Gate, but from 1776 until 1994 it was owned and occupied by first the Spanish, then the Mexican, and finally, the US armies, and almost entirely off-limits to anyone else. It has now been dubbed a major part of the Golden Gate National Recreational Area, and plans are still coalescing as to its ultimate future. At the very least, it is a spectacular park, full of nature trails, streams, forests, drives, and historic structures. In 2005 filmmaker George Lucas moved his production company, LucasFilm, to the Presidio, creating a $350 million headquarters.